Britain’s Lawrence Bayley is leading the $10k WSOP Main Event with 618,000. Some 1,100 players remain from the 2,219-strong Day 2ab field and will back on Thursday to join those who make it through Day 2c today. Bayley, who has $143,403 in live tournament winnings to date and has been dubbed an "online beast" in the past, is set to bag his biggest live cash at the 48th World Series of Poker. His previous best was fourth place at UKIPT London in 2015 for £31,000. Britain has put up the third largest most entries in this year’s WSOP with 324 players taking part. There are also 41 from Ireland. Players from the USA dominate the event however with 5,218 competing. Along with Bayley, other Brits who are through include Jonathan Prince on 417,200, Sam Grafton (314,900), Alex Goulder (310,000), Louis Salter (284,000), Peter Akery (246,000), Barny Boatman (240,000), Niall Farrell (230,000) and James Dempsey (189,500). 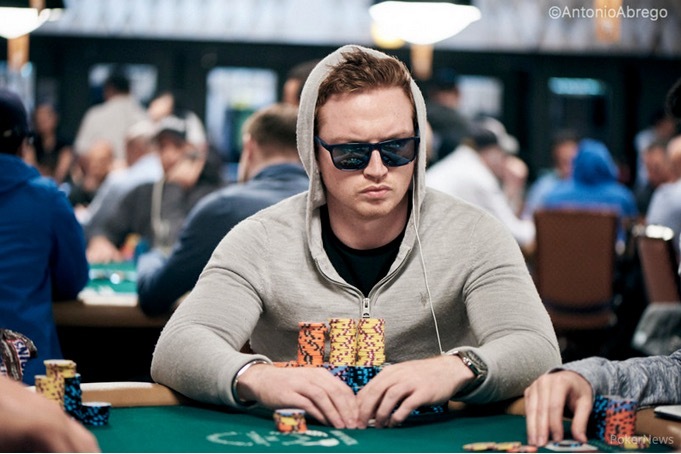 Marc Convey, former EPT commentator and founder of 23 Digital, has 37,800. Many notable players will be back for Day 3 including Marvin Rettenmaier (359,100), Charlie Carrel (343,000), 2016 November Niner & GUKPT Tournament Director Kenny Hallaert (331,800), Mike Matusow (228,200), Scott Seiver (195,600), 2005 Main Event champion Joe Hachem (134,700), and 2004 Main Event champion Greg Raymer (106,400). This year’s WSOP is the third largest ever, with 7,221 players creating a massive $67,877,400 prize pool, to be shared by the top 1,084 players. The winner will get $8,150,000 – or a cool $10 million if they are a 888poker qualifier. Everyone who reaches the final table is guaranteed $1 million. Other WSOP stories: Marc Convey and his quad kings; Debs the Destroyer runner-up in Ladies Championship; all WSOP stories. WSOP TD Jack Effel said: “I think that it’s amazing on all fronts. The third largest Main Event in history: 7,221 players, huge field, huge prize pool, lots of people getting paid, lots of people making money!